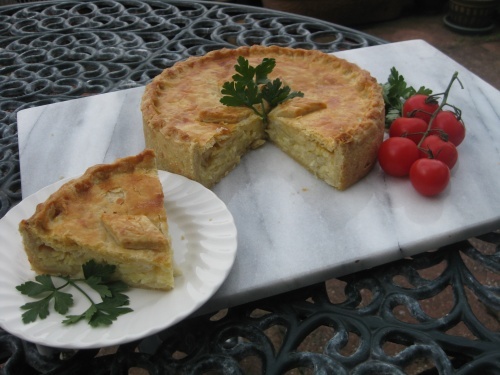 This tasty pie is good for lunch or for a picnic when it can be carried in a tin. The combination of onions and cheese is popular and is useful for vegetarians but on other occasions a little chopped ham can be added. It can be served warm or cold. You will need a 20cm/8in loose base sandwich cake tin or spring form. Filling: skin the onions. Slice them not too thinly. If they are large cut the slices in half. Melt the butter in a medium pan, add the onions and cook over a gentle heat for 5 mins until starting to soften, stirring occasionally. Put on the lid and leave on one side to cool. Grate the cheeses. Pastry: Rub the fats into the flour, add the grated parmesan cheese and a pinch of salt. Mix with just enough cold water to make a firm dough. Grease the tin and heat the oven to 190C/Gas 5. Roll out three quarters of the pastry to a neat circle to line the tin, press up the sides and fold excess outside the tin. Mix the grated cheddar and parmesan with the onions adding a little salt and pepper. Beat the egg and mix it in, reserving a tablespoonful to brush the top. Roll out the remaining pastry to a circle to fit the top. Brush the pastry in the tin with a little water, place on the top, press together and cut away any excess down to the top of the tin. Crimp the edges with the fingers just inside the top of the tin and make a hole in the centre. Place on a baking tray. Mix a pinch of salt with the reserved egg and brush the pastry. With any trimmings roll out and cut into diamond shapes for leaves. Place them on the pie and brush with egg. Bake for 30 minutes approx until the pastry is golden brown. Leave in the tin for a few minutes before pushing it out.